How true do u sound! Woh. I could make so much sense from this post. And BTW did u notice after years you have posted something related to your psychology degree. Purely adore it. Totally agree. As an individual the best gift one can give oneself is "happiness". If a person is happy by him/herself he will definitely make people around also happy. 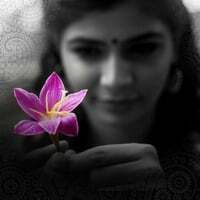 Beautiful post Chinmayi, may you find real happiness in your life. You have been such an inspiration for me. Advance Happy New Year wishes to you. yes finding someone who have the same mental state as yours is lucky but the problem is its difficult to find such! Well said is all I can say! P.S.sorry i got time to read your blog just now..and ya merry christmas!! Not sure what but you are looking really cute on the program , Extra cute , extra happiness beautiful songs . Conti to look cute and conti to sing ... btw welcome back to blogging missed you ! Wish you a happy, successful and peaceful year. May your days flooded with lots n lots of soulful songs, dubbing/translation works. Keep entertaining/ inspiring us. Take care !! i know that you are a singer and you gave voice to jessi..but your intelligence n your heart that i see from this blog made me to respect you and like you . of course i like your voice. Good for you! Wish you a Happier New Year! firstly, 'HAPPY' new year!! :)you are my inspiration..(You taught me how strong a girl should be)all i wish is..to see the bold and happy chinmayi again...what i feel is you can't lose your happiness for someone else..(who don't deserve it)and not 'a few'..you have 'a huge' well-wishers and fans here.."LOVE THE WAY YOU ARE!!" //Live. This moment. Question yourself. Find your answers.// well said chinmayi. Unrelated to your post... happened to listen to "Para Para.." from Neerparavai. It has taken me to a different world. I think this is one of your best renderings, if not the best. I'm sure you had a great experience singing it as well. Thanks for the wonderful performance!